Cooking isn't my favorite thing in the world. At our house, that's much more Andy's domain. So much so, in fact, that this morning when I lamented that I was out of Cheerios he went ahead and whipped up some pancakes. Good stuff. Anyway, we're working on improving the collective Steingruebl diet, so that means I'm at least getting dinner started before Andy gets home. It makes a huge difference when we all eat at the same time. 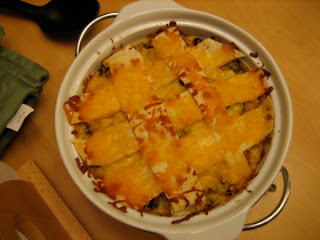 Tonight's menu item was enchiladas, but I just wasn't feeling it. (Especially after a rousing chorus of "But Mooommmmmyyyyyyy! 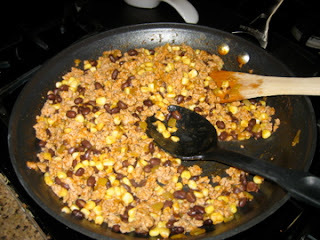 I don't like enchiladas!) Time to try something new. 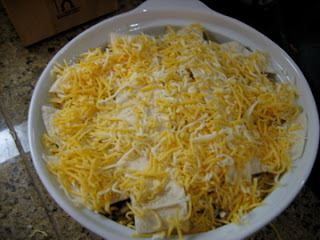 Then, I lined a round baking dish with a tortilla and put some of that cooked up stuff on it, and covered it all with cheese. 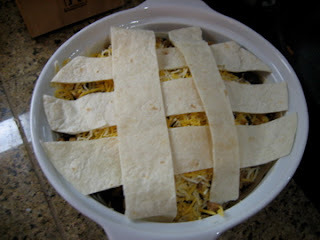 A few layers like that later, and I was ready for the finishing touch on my "taco pie." After twenty minutes in the oven, we had this! And after twenty minutes at the table, we had this. 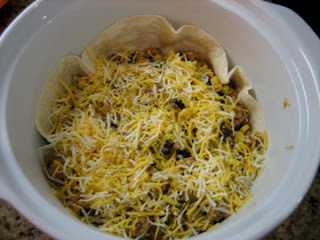 Elise didn't want taco pie. She informed us in her most pathetic, whiny voice that she wanted strawberry pie instead. I think she was annoyed that we laughed. Then she told us that she did not want any dinner at all. Sigh. I'm convinced that she will eventually eat like a civilized person. We liked my concoction, and will likely have it again sometime soon. Or maybe we'll all just have strawberry pie for dinner. Not that this is wildly better than that, but it's a start. Playing around in the kitchen sometimes results in better dinner than you'd find from a recipe. 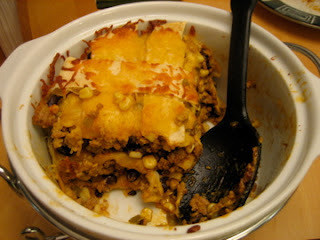 Taco pie looks really good, by the way.